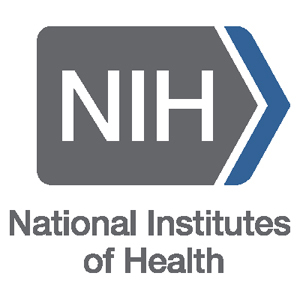 The National Institutes of Health (NIH) is an agency of the United States Department of Health and Human Services (HHS)and is the primary agency of the United States government responsible for biomedical and health-related research. So when the NIH hosts an “IMPORTANT WARNING” on its website, it has the weight of the U.S. Department of Health behind it, which makes it absolutely official. 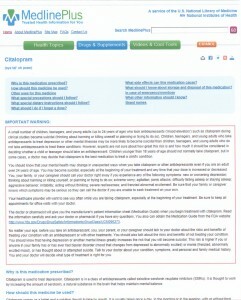 This can be found on the NIH sub-site called MedlinePlus, which provides consumer health information for patients, families, and health care providers. This brings together information from the NIH, the U.S. National Library of Medicine, other U.S. government agencies, and health-related organisations. No matter your age, before you take an antidepressant, you, your parent, or your caregiver should talk to your doctor about the risks and benefits of treating your condition with an antidepressant or with other treatments. You should also talk about the risks and benefits of not treating your condition. You should know that having depression or another mental illness greatly increases the risk that you will become suicidal. This risk is higher if you or anyone in your family has or has ever had bipolar disorder (mood that changes from depressed to abnormally excited) or mania (frenzied, abnormally excited mood), or has thought about or attempted suicide. Talk to your doctor about your condition, symptoms, and personal and family medical history. 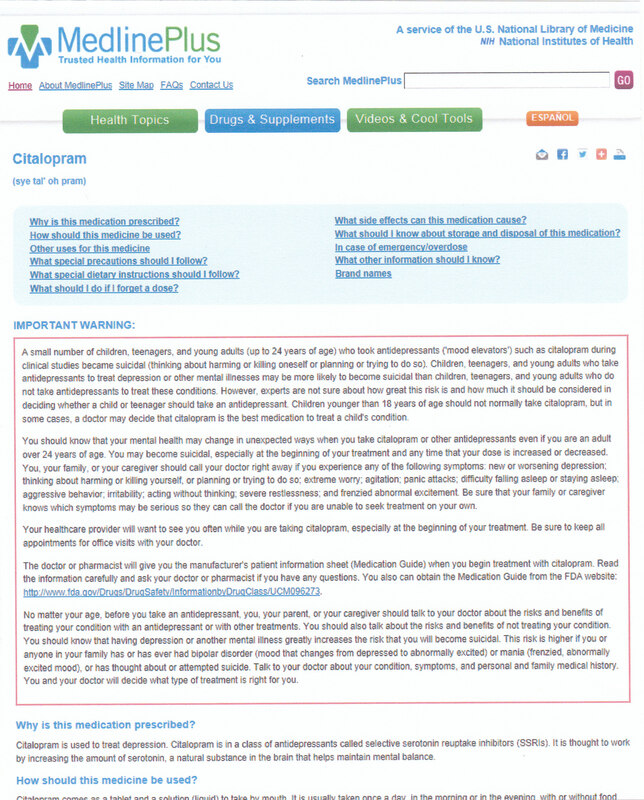 You and your doctor will decide what type of treatment is right for you. The information provided beneath each heading is comprehensive, and clearer than any Patient Information Leaflet (PIL) for Citalopram that I have seen. The same format is used for other antidepressants, such as Paroxetine (Seroxat), Fluoxetine (Prozac), Sertraline, Mirtazapine and Amitriptyline. What concerns me is that there appears to be no equivalent British website. Result no. 2 linked to The NHS Choices site. Here the Overview section states: Some people who take Citalopram hydrobromide may find that it intensifies depression and suicidal feelings in the early stages of treatment. These people have an increased risk of self-harm or suicide in the early stages of taking Citalopram hydrobromide. 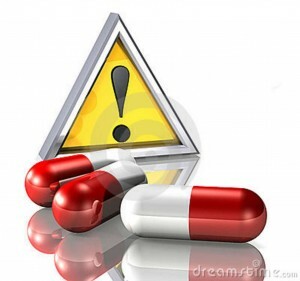 As Citalopram hydrobromide starts to work these risks decrease. If you are taking Citalopram hydrobromide, or you care for someone who is taking Citalopram hydrobromide, you need to look out for changes in thoughts or behaviour that could be linked to self-harm or suicide. If you notice any of these changes or are worried about how Citalopram hydrobromide is affecting you or someone you care for, you should contact your prescriber, a mental health professional or NHS Direct as soon as possible. When a person takes their life after a week or so after prescription of antidepressants, the manufacturers have been known to contend that the victim must have had an underlying, unreported severe depression. They absolve themselves of blame on the grounds that their product does not start working properly until after two to four weeks. NetDoctor’s advice echoes this stance fairly closely. It is appalling to realise that somebody undergoing an adverse reaction to an antidepressant in the UK cannot find an official suicide warning that is adequately worded and displayed. While thousands of people each year in the UK are taking the lives of themselves and/or others while under the influence of antidepressants, the Department of Health and the Pharma-funded MHRA continue to do nothing to help rectify the situation. As long as there is a revolving door at the MHRA the public will always be in danger of medicines they are prescribed. Last minute sub made by GSK, off the field is Woods and on comes up and coming rising star Hudson. John le Carré couldn’t have devised such a plot. Thanks Fid – it’s time for Pharma-funded MHRA to be kicked into touch and replaced by regulators who actually regulate.